San Francisco emerged, famously, with the Gold Rush and over the following century became America’s portal to the Pacific world. In this period the Bay’s shoreline developed as a regionwide port for defense and offense, with the most transformative period during World War II. In the postwar years the region sprawled, like Los Angeles. Today the nine-county Bay Area has more than 7 million residents. It’s a megacity, with a big wet hole in the middle. The Bay itself can be viewed as a geographic paradox: a place and a void. The collective “Bay” (composed of San Francisco Bay, San Pablo Bay, and Suisun Bay) both unites and divides the community of the Bay Area, giving identity to a region while separating its populace. The Bay is a back space where the hardened surfaces of the industrial city crumble into the water, as well as a shore front with designed parks and recreational marinas. It is intensely visited in places and nearly inaccessible in others; its beauty acclaimed, its dumping grounds unparalleled; its sparkling water refreshed from Sierra snowmelt, its sewer outfalls and urban runoff robust. Once intensely militarized, it is now, just as intensely, demilitarized. In a sense, the Bay is a natural entity, borne of great rivers draining the entire Central Valley of California; however, every inch of its shoreline today is the product of human activity, by either intent or incident. Coolidge’s descriptions of these sites are fascinating and full of distilled information. 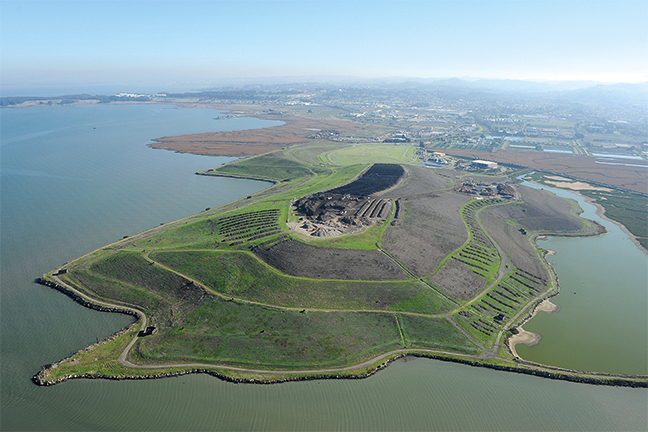 The more derelict and ruderal sites documented in the book – like the Alameda Naval Air Station, the Oyster Bay Regional Shoreline, the many landfills – read like a source book for speculative design studios; their programming revealed to be adrift and feral until their reformation as some other sanctioned form of urban productivity.